WRENTHAM, Mass. 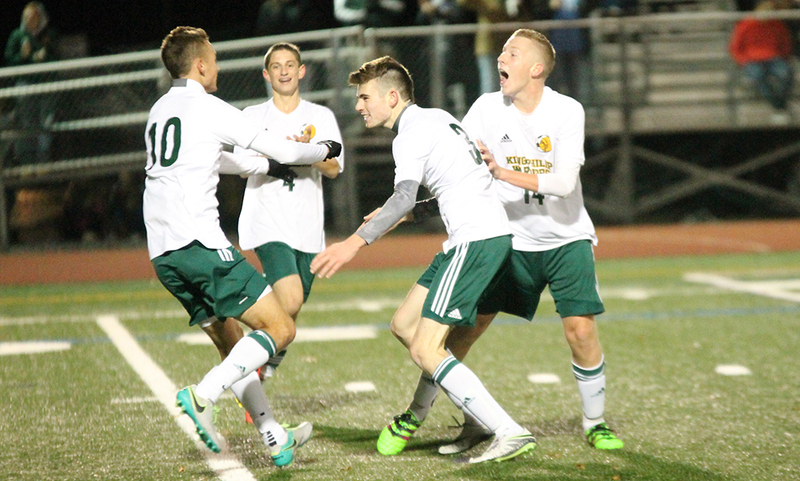 – In a battle of division leaders, King Philip reigned supreme with a dominating performance and a convincing 5-0 win over Sharon. The Kelley-Rex division leading Warriors netted a pair of first half goals a minute apart and then tacked on three more goals in the second half to take down the Davenport division leading Eagles. 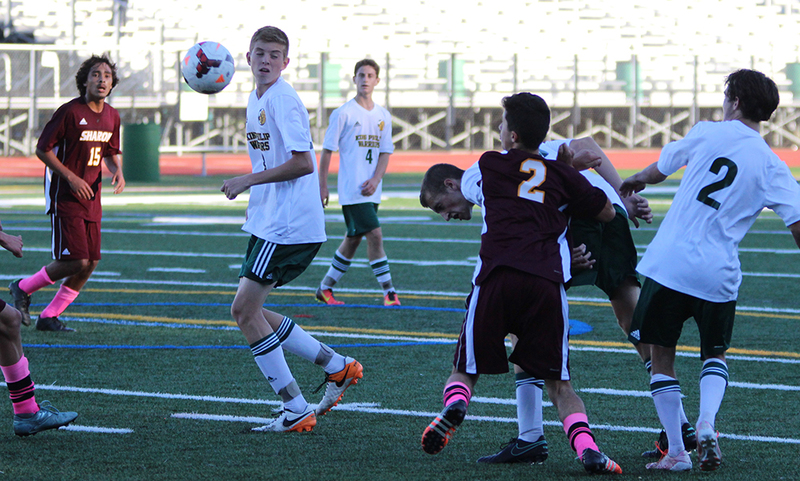 “I have to give major props to my midfield,” King Philip head coach Nick Gale said. “I thought Connor [Mullins] had an awesome, awesome game. Our goal was to build up through our midfield whenever possible and Connor’s a huge cog to that. And he had three assists today. He was a major factor today in our success today. Mike Rowe registered the first shot of the game, his tough angle shot by Sharon keeper Ethan Kantorin the 4th minute. A nice sequence between Tyler Mann and Anthony Bozza in the 13th minute resulted in another save from Kantor at the near post. 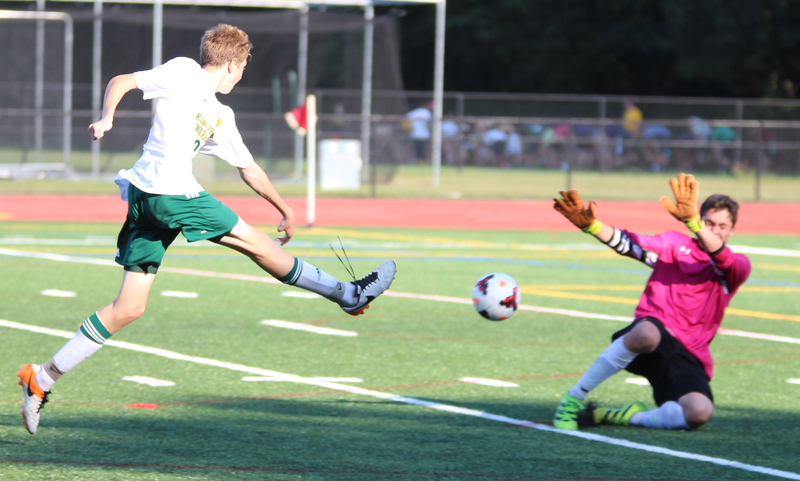 Thomas Lugten latched onto a shot in the 21st minute but Kantor notched another save. Finally in the 29th minute, the Warriors broke through. Connor Mullins dropped a corner kick onto the six yard box that Kantor dove out and got a paw to off the bounce. The ball went right to Cam Mullins, who buried it with his head for a 1-0 lead. Exactly a minute later, Connor Mullins played a ball over the top to senior Colby Koch. Koch took a touch and blasted a shot from just inside the area to double King Philip’s lead in the 30th minute. Sharon’s first chance came in the 34th minute when Oliver Hu‘s touch beat charging KP keeper Eli O’Neill but senior defender Ryan Coulter cleared it away before any harm could be done. The Warriors took advantage of another corner in the 52nd minute with the Mullins’ brothers linking again. Connor’s service found the head of Cam, who looped his header to the far post and under the bar to make it 3-0. Less than 10 minutes later, junior outside back Larsen Keys was first to a 50/50 ball and his touch turned into a perfect through ball. Mann ran onto the ball alone and buried his shot at the far post to put King Philip up 4-0. King Philip capped the scoring in the 76th minute, cashing in on another set piece. Cam Mullins’ service from midfield found the head of Coulter at the far post but Kantor made an acrobatic save to keep it out. However, the rebound fell to Cameron McGovern, who tucked his shot into the side netting from close range to make it 5-0. King Philip boys soccer (11-0-1, 9-0-1) now has a four point lead in the Kelley-Rex division and will travel to North Attleboro for a league match on Thursday. Sharon (4-3-2, 4-3-2) hold a one point lead in the Davenport division and will return to action on Monday when they host Norwood for a non-league contest. WRENTHAM, Mass. – It’s no secret that if you want a chance at beating a top team in the state, you have to play a near perfect game. 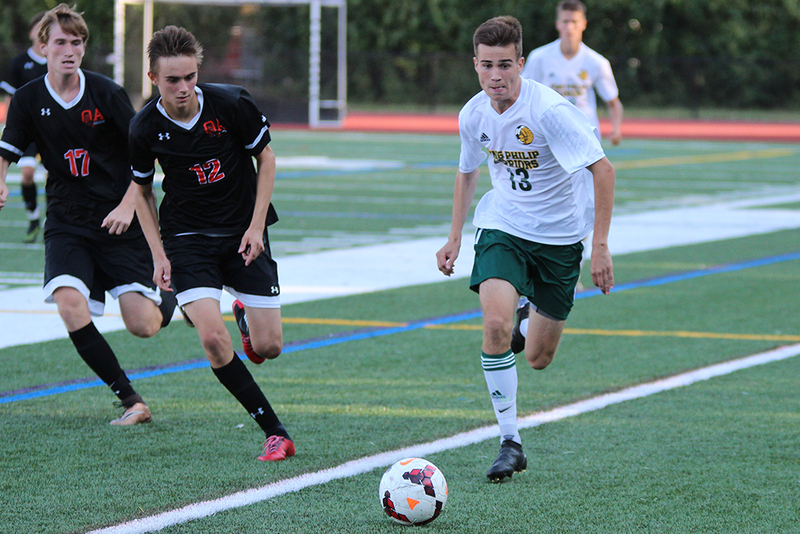 King Philip scored a pair of goals in a flawless first half, kept Oliver Ames at bay for the first 20 minutes of the second half and held of a furious charge at the end to pick up a 2-1 win over the Tigers. KP’s win snapped Oliver Ames 25-game unbeaten streak that spanned the entire 2015 season and the start of this year. The Warriors had full control in the first half, with the majority of possession and chances. KP was content to keep possession in its own third but worked nicely into the midfield and into the final third to create chances. The first chance came in the 6th when Jack Bush found Colby Koch, whose cross was touched to Tyler Mann in the center of the area, but his shot was deflected wide. Two minutes later, Thomas Lugten and Koch combined for a 1-2 but OA goalie Ben Kemp stopped Lugten’s point blank shot. OA’s best chance in the first half came in the 18th minute when junior Cam Vella was able to find some space at the top of the area but his shot flashed wide. King Philip continued the pressure and was able to breakthrough in the 26th minute. Bush, from his outside back position, was able to get up field and had time on the ball. He picked out Koch with a perfect pass and Koch used a class one-time finish with his left foot to find the back of the net to put the Warriors up 1-0. Koch clanked the post with a shot from just inside the area in the 32nd minute but less than a minute later, the Warriors doubled the lead. Mann, who was dropped deeper in a midfielder role rather than his normal striker spot, lifted a perfect ball over the top of the defense, finding a streaking Larsen Keys – KP’s other outside back – and the junior calmly finished one on one with the keeper to make it 2-0. “We got two points coming from outside backs, which is phenomenal.” Gale said. “It was something we thought they were going to take away from us but we found a way to get around it and get some points. The thing I was most proud of in the first half was our focus on finishing, which is something that against a phenomenal team I thought we were going to struggle with and we found a way to get it done. I’m proud as hell of my guys. Oliver Ames amped its pressure up to start the second half. After Mike Rowe had his shot in the 48th minute saved by Kemp for KP’s first chance of the second half, Oliver Ames’ Thomas McCormick registered the Tigers’ first scoring chance of the second half, but his shot hit the crossbar and stayed out. Ten minutes after McCormick hit the bar, Oliver Ames had another chance in the 69th minute when Matt Campbell’s corner found Vella, but his header was saved by KP keeper Eli O’Neill, who went full stretch to get the stop. The Tigers finally broke through in the 75th minute, as Campbell played James Gillespie in alone on goal and the junior finished to pull OA within one. OA kept the pressure up the final five minutes, but KP’s defense was able to clear off the danger. “They cashed in on two chances, which is what they wanted to do and they were successful.” Barata said. “We have a lot to work on but we’re young, we’re figuring it out, it’s still a young season. I think we’re in a good position. I think the last 20 minutes – if that’s how we play, I think a lot more teams will be concerned about playing us. Right now they’re not because we’re soft but we’re young, I’m not too worried about it. Gale’s decision to drop Mann into the midfield paid big dividends as the junior paired with classmate Connor Mullins to help the Warriors control the midfield. Meanwhile, KP’s center back pair of Ryan Coulter and Cam Mullins helped the Warriors keep possession along with Keys and Bush. 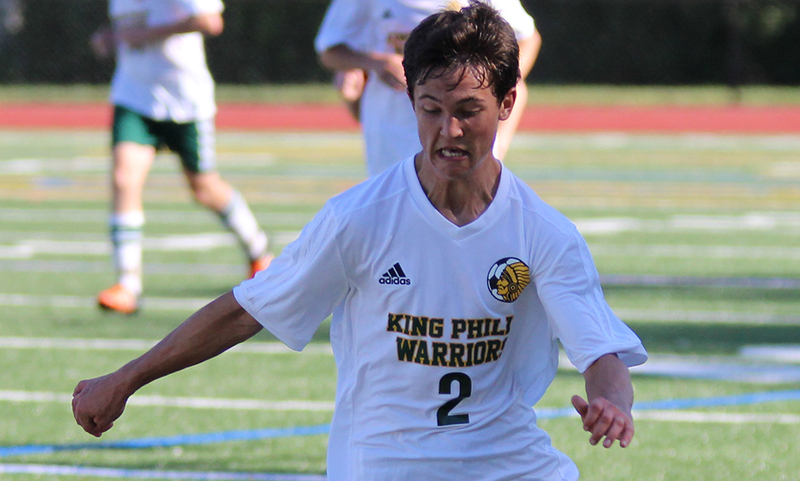 King Philip boys soccer (6-0-1, 4-0-1) moves into a tie with Mansfield for first place in the Kelley-Rex division. The Warriors will be back in action on Monday when they host Taunton. Oliver Ames (3-1-1, 3-1-1) will try to bounce back the same day with a trip to Attleboro.